Another piece of the V-Reds exhibition season has been revealed. The NCAA's UMass Lowell River Hawks released their men's hockey schedule yesterday, and their first game of the year takes place October 8th vs. the defending CIS National Champs. This is in addition to the games against New Hampshire and Maine the week before. According to ReDSea, UNB played UMass Lowell in 2007 and came out on the wrong side of a 5-3 game. They were scheduled to play the River Hawks last year, but scheduling conflicts resulted in a game vs. UMass Amherst instead. According to TSN, the Toronto Maple Leafs have re-signed former V-Reds forward Darryl Boyce to a one-year contract. Last season Boyce scored 5 goals and 8 assists in 46 games for the Leafs, and earned the trust of coach of Ron Wilson. UNB captain Kyle Bailey will take the next step in his hockey career by attending the NHL summer development camp of the Edmonton Oilers this week in Edmonton in hopes of garnering an NHL contract with the Oilers. 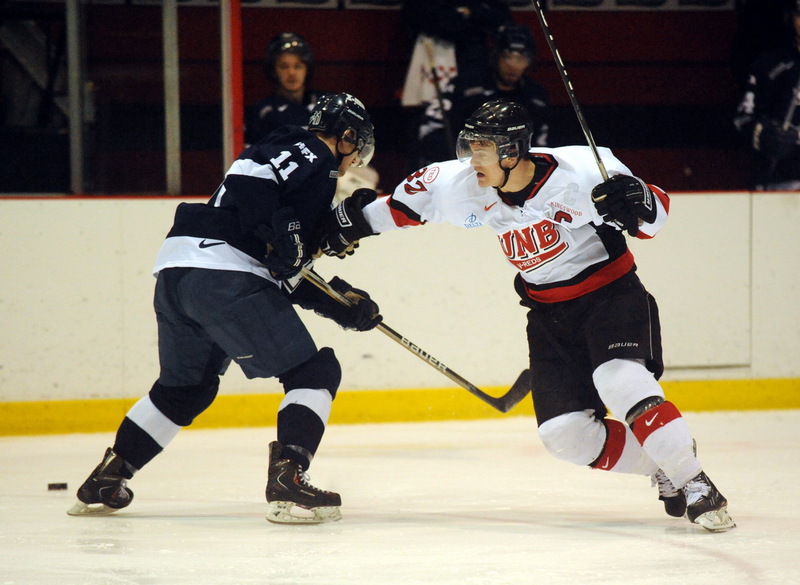 The native of Ponoka, Alberta had an outstanding career at UNB where he played a key role in winning two National Championships along with a National Silver medal in 2008. The 6”2 200 lb centre man was a former 4th round draft pick of the Minnesota Wild and had played five seasons in the WHL with Portland and Lethbridge. He decided to attend UNB and graduated with a Business degree and achieved Academic All Canadian status in all four years at UNB. He was a two time CIS Nationals All Star and is among UNB’s all time scorers at the Nationals. He was the 3rd UNB player in history to the AUS Godfrey award in 2010 and was a CIS finalist for the distinguished Randy Gregg Award. During his UNB career, he developed a penchant for scoring key goals including 2 overtime winners to win AUS Championships in 2008 and this past year. His regular season career stats at UNB included 49 G , 71 A for 120 points in 111 games played. “ Kyle has had an outstanding career here at UNB and has developed into one of the top players in the CIS. He has outstanding leadership abilities, high energy level and work ethic, very tough to play against and has developed his intangibles and his skill level to the elite level in our league – he has a great foundation for success at the next level in his professional career.” were the words that UNB Head Coach Gardiner Mac Dougall used to describe his popular captain for the past two seasons. Bailey will join his four year teammate Hunter Tremblay at the Oilers camp as Tremblay earlier became the 4th UNB player in the past five years to ink an NHL contract. Tremblay had finished the season with Oklahoma City of the AHL. The AUS has released the 2011-2012 and the Varsity Reds open the season at home vs. a familiar foe when the STFX X-Men visit the AUC on Friday, October 14th. The schedule doesn't get much easier the next night when the SMU Huskies roll into town. Troy Ryan's STU Tommies don't visit UNB until November 9th. The AUS wraps up regular season play on February 11th, with UNB hosting UdeM to close out the year.